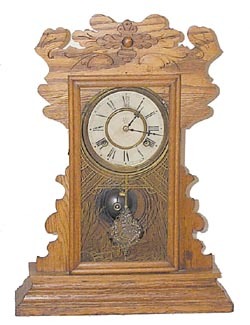 Waterbury Clock Co. kitchen clock, "Hobart", ca 1893. Oak case is 20 1/2 inches, should be 22 inches, missing a top ornament and 3 applied decorations on top. The dial, glass, and pendulum, are all original. 8 day, gong strike, strong runner. Ly-Waterbury No.1621.